First, here are a couple examples of the limitations I mentioned. 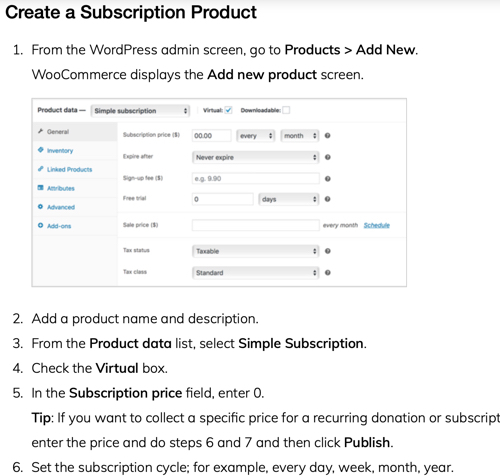 I write WordPress “How To” procedures on my blog. These procedures are presented in a numbered or bulleted list. In either case, I often use an image within the list item to illustrate the step. In the image below, step 1 has a soft return with an image inserted there. You can’t do this in a List Block. In addition, with the Gutenberg List block, you can’t insert a PDF link, and you can’t insert a soft return to create an empty paragraph below the list item. Normally, to create a soft return, you hold down the Shift key and hit Return. If you do this in the List Block, it inserts a new bullet or number. In the image below, notice that the List Block toolbar has no button to insert media. You can only insert a link. In addition to procedures, people often use a list to create links to PDF documents. You cannot do this with the new List Block. To overcome the limitations of the List Block, use the Classic Block instead. You can insert the Classic Block anywhere in your post or page if you are using the Block Editor. 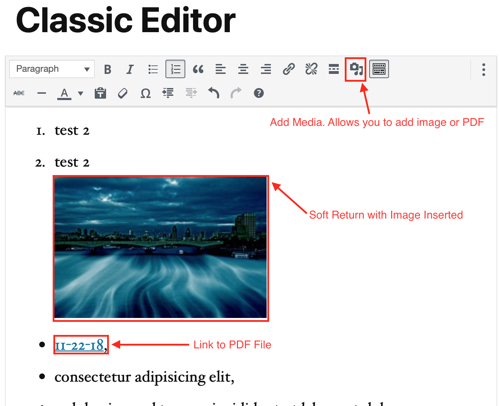 The Classic Block allows you to insert images, PDF links, and soft returns. The Classic Block also allows you to insert PDF links in the Paragraph Block. 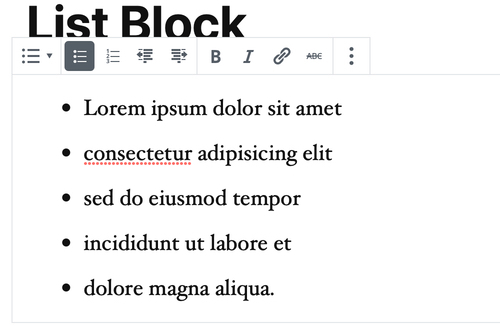 The Classic Block allows you to use the new Gutenberg Block Editor and still use the Classic Block when you need the features of the Classic Editor. Click here for how to insert a PDF in WordPress.